On a bleak January day, when it’s too wet to get outside, my thoughts have turned to the benefits of gardening. I chanced upon the website of Country Living Magasine, where they are advocating that “gardening should be available on the NHS”. Gardening, along with other outside activities, is being promoted as a panacea for all ills: – we are living an increasingly sedentary life – we have lost touch with where our food comes from – children spend less time playing outdoors – and in a largely urban society we fail to notice nature and the changing seasons. I’m not just talking about exercise, fresh air or even fresher food from the garden, but the sense of well-being that comes from working outside – it’s good for mind, spirit and soul. I can testify to this myself – I’m prone to depression and the best therapy I’ve found is neither Prozac nor Cognitive Behaviour Therapy (I’ve tried both) but getting out of the house for a good walk, or doing something – anything – in the garden. There is always a task to be done, from sowing seeds in the greenhouse to some vigorous pruning with a large saw, and it takes my mind away from any worries and irritations that I might dwell on. A day without some time in the garden doesn’t feel complete. Many people have cited gardening as their salvation. Monty Don – in The Jewel Garden – has written very openly about how it rescued him from financial disaster and a serious mental breakdown. I personally have seen its therapeutic effects in others. Country Living was reporting on the annual John MacLeod lecture to the Royal Horticultural Society by a GP, Dr William Bird, and a researcher from Sweden, Dr Matilda van den Bosch, who both outlined the evidence for the positive action of gardening on many aspects of health. Dr Bird asserts that £1 spent on Horticultural Therapy could give rise to £5.00 in health benefit. There is a charity called Thrive which has been putting these ideas into action since 1978. 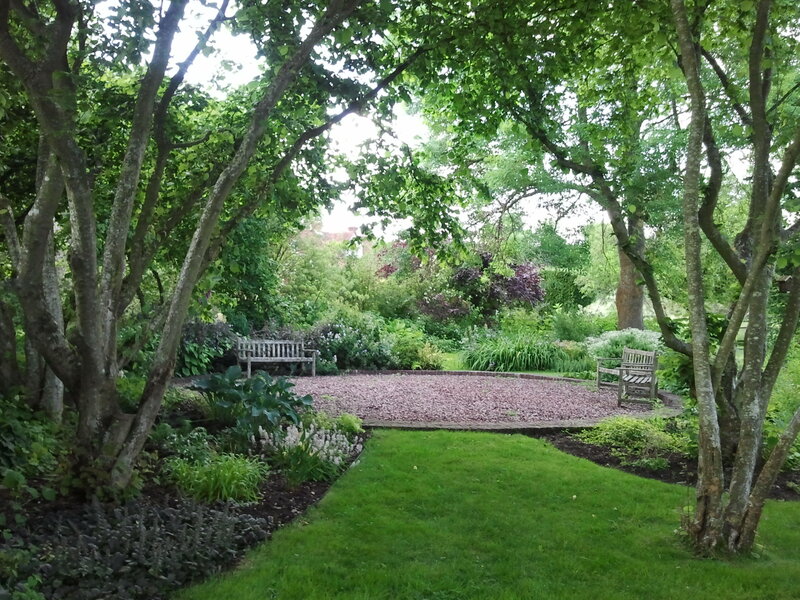 They run activities at several gardens around England, helping people with such diverse conditions as stroke, visual impairment, learning difficulties, post traumatic stress syndrome, cancer, dementia and mental health problems. They even encourage some of their clients to gain horticultural qualifications and help them to get a gardening job. Do have a look at their website if you would like to know more. It seems that there is no shortage of evidence for the benefits of gardening. It just needs more people to get involved. For my part I have signed-up for Thrive’s monthly e-newsletter and joined as a member to see if there is anything I can do. I’m a retired Doctor and it would have been good if I could have prescribed gardening as a cure – I’m sure many of my patients would have benefitted. Wouldn’t it be great if there was a Centre for Horticultural Therapy in every town (though it might need a more catchy name!). Maybe one day the Government will see the sense of this – but, sadly, Politicians tend to work in the short term, whilst gardeners plant trees for future generations to enjoy. I braved the weather and potted up some nicely-rooted cuttings in the greenhouse today – I felt better for it. And here is a tranquil photo of our garden last summer – how pleasant to look at on a dreary January day. this was a good thing to read Pen and i so understand that feeling of well being when I get out there in my small garden and do some work….I love it and it loves me back. Absolutely agree with this. It’s like all projects that people are able to get ‘stuck in’ to, nothing comes close to the sheer pleasure of doing it, other than perhaps the satisfaction of admiring your achievements afterwards. Gardening is unique among other creative endeavours in that you’re constantly benefitting from your ever evolving hard work even just by glancing out of the window. Thanks Alex. Good wishes for your endeavours. I totally agree. Sadly I don’t get out in the garden much, but when I do I find it mentally absorbing and physically envigorating, leaving a very pleasant warm type of ache which I instinctively know is healthy and not morbid. Must do it more! I have been cycling a bit though which leaves a similar feeling as does my greatest delight – sea rowing. Your garden looks marvellous, unfortunately over 3 hours away from us in Suffolk so a visit will take a bit of planning. It would be difficult to disagree with you on gardening as a health benefit, I can’t see how it could be bad for you, I know it’s good for me. We have just recently moved here from Glasgow, the garden was a ruin, neglected for around 30 years, but in 6 months we’ve achieved a lot and I hope to be able to post some photos showing our progress in the summer. Thanks for your posts, they encourage me. Thanks for your kind comments. Good luck with your garden and the job search. And come to see us if you are ever in Hampshire!